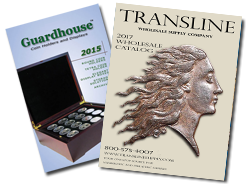 Guardhouse heavy-duty coin tube boxes for shipping Guardhouse Medallion tubes for 1 oz rounds are designed to perfectly accommodate 500 ozs of silver. Made in the USA, Guardhouse heavy-duty coin tube boxes feature re-enforced tape filaments and internal dividers constructed of thick, multilayer chipboard. Guardhouse coin tube boxes have a high quality exterior, are manufactured with thumb-cut notches and are ideal for shipping or storage.